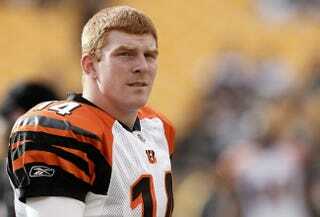 The Cincinnati Bengals are going to win tonight's game against the Miami Dolphins. They are going to win it by more than a field goal. But why? Let's break down Thursday Night Football and pick the over/under and against the spread. First of all, the Bengals are far stingier defensively than the Dolphins. Cincy is allowing over 30 fewer yards per game and 5.9 fewer points per contest than Miami. To further drive the point home Football Outsiders has the Bengals ranked fourth in DVOA, while the Dolphins sit at 22nd. Miami is also ranked 29th in DVOA against the run. Offensively, the Bengals are ranked ninth in total offense, while Miami is ranked 28th. Football Outsiders has Cincy ranked 11th in offense, and sixth in passing. Miami, again, is inferior with an offensive ranking of 19th. Andy Dalton seems to have developed a great connection with Marvin Jones, and the Bengals offense has really taken flight as a result. They will win this game handily. As for the over/under, both teams have gone over the total in the majority of their games this season. Given the offensive prowess of the Bengals, this game will likely be no exception.